Abstract: Objective To evaluate the association of plasma microRNA-107 (miR-107)expression with the clinicopathological properties and prognosis in non-small cell lung cancer (NSCLC)patients. Methods Plasma and tumor tissue samples were collected from 196 NSCLC patients. Total RNA was extracted and miR-107 expression was evaluated by real-time polymerase chain reaction. Results Expression of miR-107 in plasma was positively associated with expression in tumor tissue (r=0.456, P < 0.001)and with lymph node metastasis (LYM) (r=0.168, P=0.018), but was not correlated with other clinicopathological features. In the tumor tissue samples, miR-107 expression was positively correlated with pathological grade (r=0.304, P < 0.001), tumor size (r=0.230, P=0.001), LYM (r=0.446, P < 0.001), and TNM stage (r=0.294, P < 0.001). The 5-year disease-free survival (DFS)and overall survival (OS)rates were 13.6% and 32.8%, respectively. Kaplan-Meier curves revealed the correlations of the high expression of plasma miR-107 with worse DFS (P=0.002) and OS (P < 0.001)compared to that of low expression. High expression of miR-107 in tissue samples was associated with worse DFS (P < 0.001)and OS (P < 0.001). 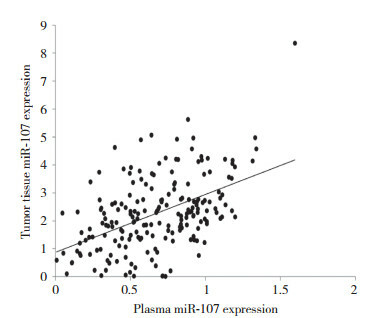 Univariate Cox proportional hazard regression analysis indicated correlations of high expression of miR-107 in plasma (P=0.003)and tissue (P < 0.001)with worse DFS and OS. 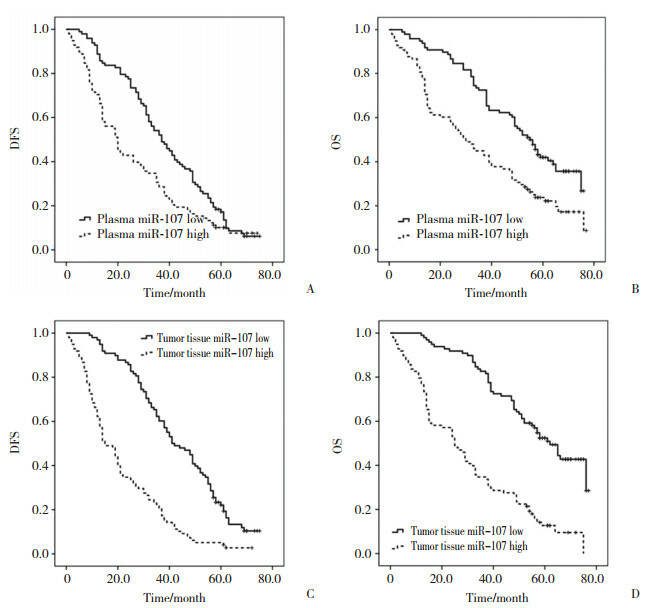 Multivariate Cox regression analysis revealed that high expression of miR-107 in plasma (P=0.005)might predict OS for NSCLC, while high expression of miR-107 in tumor tissue is an independent risk factor for shorter DFS and OS (both P < 0.001). Conclusion Circulating miR-107 is a novel and potentially important prognostic biomarker in NSCLC patients. ZHANG JJ, WANG CY, HUA L, et al. miR-107 promotes hepatocellular carcinoma cell proliferation by targeting Axin2[J]. Int J Clin Exp Pathol, 2015, 8(5): 5168-5174. ZHANG Z, ZHANG L, YIN ZY, et al. miR-107 regulates cisplatin chemosensitivity of A549 non small cell lung cancer cell line by targeting cyclin dependent kinase 8[J]. Int J Clin Exp Pathol, 2014, 7(10): 7236-7241.